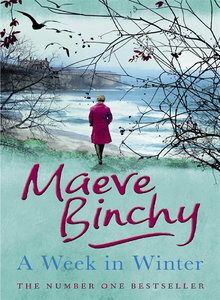 A Week in Winter is a charming tale and the last book written by Irish author Maeve Binchy. It starts with the story of a young girl called Chicky, who lives in an idyllic village called Stonybridge in Western Ireland. One day a young American man visits the town for a holiday and the pair fall in love. Chicky follows him to New York against her families wishes. She stays there for twenty years – but life hasn’t quite worked out how she planned and she keeps a secret from her family. But she finds herself, years later, returning home and working to open up a hotel in the old Stone House set by the wild Atlantic Ocean. From this opening story, the reader is taken into another character’s story and then another as a bunch of very different people assemble for the hotel’s opening week – for a week’s winter holiday. Some of the people work at the hotel, others are guests. Each character’s story tells what brought them to the hotel and how their week there changes them. One visitor is a Hollywood movie star, another is a bitter old retired school principal … each has their tale to tell. I’ve read many of Maeve Binchy’s books over the years and they were always non-taxing and enjoyable to read. Her books contain real characters and the writing is simple and heartfelt so you barely realise how fast you are ploughing through the pages. And of course, I love reading a story set in a beautiful part of Ireland, full of quirky characters. It was really a lovely book for Maeve to have as her last. She was a true storyteller.